Fig. 1. William Preston Beaver passport photo of October 1916. William Preston Beaver (1865-1927), was born on September 5, 1865 at Lewisburg, Pennsylvania, the son of Peter Beaver (1816-1890) and Mary Ann Armstrong (1823-1912). He is the great-grandson of Thomas Preston. He worked as a clerk for the Pennsylvania Railroad in 1885, working in Philadelphia, Pennsylvania. He was a member Sigma Chi fraternity. He graduated with a B.A. Capitalist. He was listed as living at 82 Park Street, Montclair, New Jersey at that time. He graduated Bucknell University, Pennsylvania, with an M.A. in 1885. He was listed as living at Bloomfield, New Jersey at the time. He worked as the Secretary of the Pittsburgh Tin Plate Works, New Kensington, Pennsylvania. Later on as auditor. 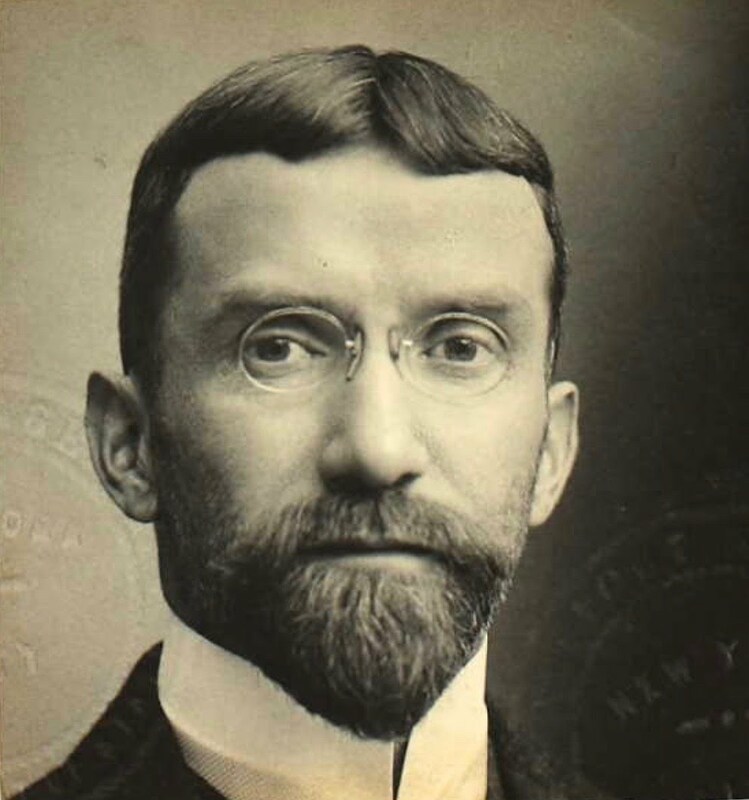 On January 8, 1895, he married Ellen Brooks (1871-), daughter of Charles Preston and Mary Hurley Brooks of East Orange, New Jersey. She was a graduate of Wellesley College. Late fall in 1895 they had a daughter Miriam. He was collecting U. S. Colonials and tokens and medals since at least 1889 until at least March 1896 from the Chapman Brothers. According to the 1900 U.S. Census he and his wife were living at her parents' home in East Orange, New Jersey. According to his passport in November 1904 he lived in Glen Ridge, New Jersey. While at Glen Ridge, they had two sons William Preston Beaver, Jr (1901-1904) and Gilbert Beaver (1903-1904) who both died in their infancy in 1904. Fig. 2. 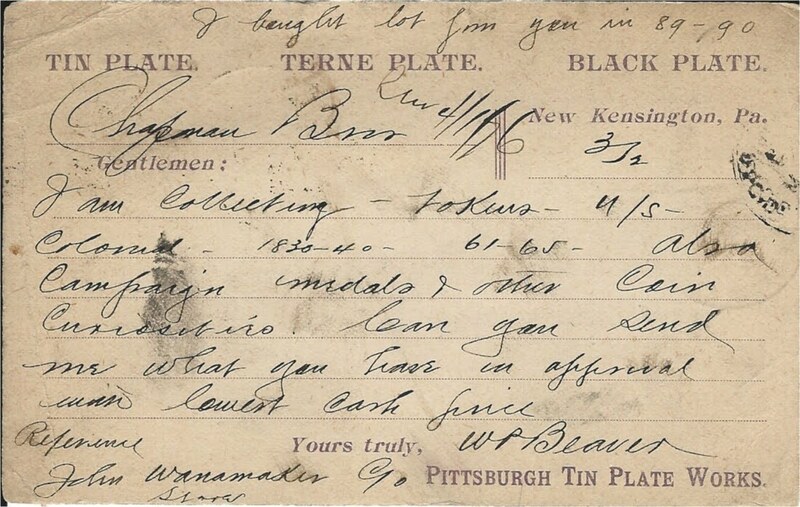 Company Postal Card from William Preston Beaver to the Chapman Brothers postmarked March 2, 1896 from New Kensington, Pennsylvania. "I bought lot from you in 89-90. I am collecting - tokens - U/S - Colonial- 1830-40 - 61-65 - also Campaign medals & other coin Curiosities. Can you send me what you have on approval with lowest cash price. W.P. Beaver. Reference John Wanamaker C/o Store." In March 1908 he traveled to Athens, Greece. According to his 1916 passport he lived in Montclair, New Jersey, when he took a cruise that October from the port of Seattle, Washington to Japan, Siam, Java, Hong Kong, Singapore, Burma, and India aboard the Express of Russia sailing out of Vancouver. In 1920 he travelled to Havana, Cuba. According to the 1921SS Nieuw Amsterdam passenger list sailing from Plymouth, England to NYC he lived at 104 East 40th Street, New York City, New York. In 1924 he traveled to Genoa, Italy aboard the Conte Verde. He died on February 25, 1927 at Manhattan, New York.